2. You're the parent. Guidance and discipline are in your job description. But what to tell you in terms of implementing a grace-filled approach in your own home? What does it look like to successfully create and maintain boundaries while showing our kids grace? "My daughter has been working hard (not always successfully) at not lying. Today she had permission to use the iPad during quiet time to listen to music. About 75% of the way through quiet time I looked in her doorway and could tell that she was watching something on the screen, not listening to music. (No screen time during the week). I walked in and she quickly shut it, trying to look innocent. I asked, "Why are you watching a movie?" She started to say that she wasn't and then her face crumpled and she started crying. She said, "I don't know why I keep doing wrong things!" I calmly told her, "Honey, it's because you're a sinner, just like me and daddy and everyone else. She kept crying, really upset that she didn't make the right choice. I told her that because she is remorseful it shows that she is letting God work on her heart. I told her God is making her a new creation. She started to become calmer. We prayed together. I told her quietly that she wouldn't be able to use the iPad for a while. She understood. We hugged and I left. I thought to myself, "That's what grace looks like - not crazy-harsh punishment that would harm our relationship. But lovingly pointing her to Jesus, who wants to make all of us new. Behavior is not the center of Christianity. Jesus is. So we teach our kids to choose those things that will bring them life, we show them how messed up we all are, and then we point them back to Jesus. All the time. Every day. You, too. Because like my friend's daughter, you don't always choose to do the right thing. Neither do I. Neither did the apostle Paul! (Romans 7:!5) And the answer on any given day for any one of us is not, "Behave better! You didn't? Well, now, here's your punishment! Try harder next time!" Those are lifeless, soul-crushing words that squeeze the gospel right out of our homes. Grace gives life. Jesus is our perfection. And we are free to love others from a place of emotional safety and transparency because we know that all our yuck is covered by the beauty and majesty of our gracious savior. I'm not sure I understand grace. In fact, I know I don't. In all of the years I've lived and all of the years I might have in front of me, I'm sure beyond a doubt that I have not and will not plumb the depths of this life-altering thing called grace. It pours out lavishly. It is not a discerner of circumstances or educational backgrounds or relationships or status. It often doesn't make sense. When we try to capture its fullness in metaphors about ice cream and elephants, we miss its facets and slough off a lot of the natural patina. We cheapen and ignore its many complicated yet simple layers. Because we're just us - messed-up people. Whenever I mention a grace-filled approach to parenting amongst Christians, many narrow their eyes and view me with suspicion. "What does that mean? ", they question, their words thick with distrust, scorn, and self-righteousness. We're particularly good at the self-righteousness. I usually fumble a response because I can sense I'm not in a safe place where the benefit of the doubt is given, or even an honest attempt to truly understand my meaning. "Do you think Kendra still spanks her kids? ", a friend was asked recently. That's funny, isn't it? So, grace in our homes = no discipline. Or, spanking is the only method that will produce good kids. Or something. And lest we swing that pendulum, let's remember this about grace: it's free. We didn't earn it. We don't deserve it. When Jesus gushed it out all over the world that day He hung on the cross at Calvary, He didn't say, "But I'll take it back if you don't behave." No. What He actually said was, "It is finished." 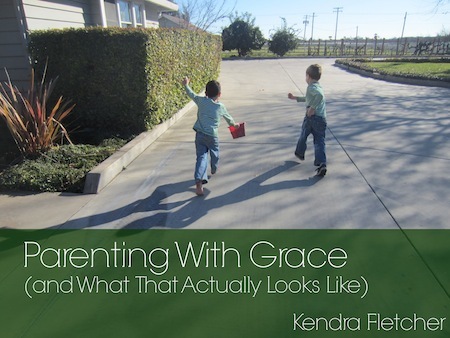 What Does Homeschooling From a Place of Grace Look Like?